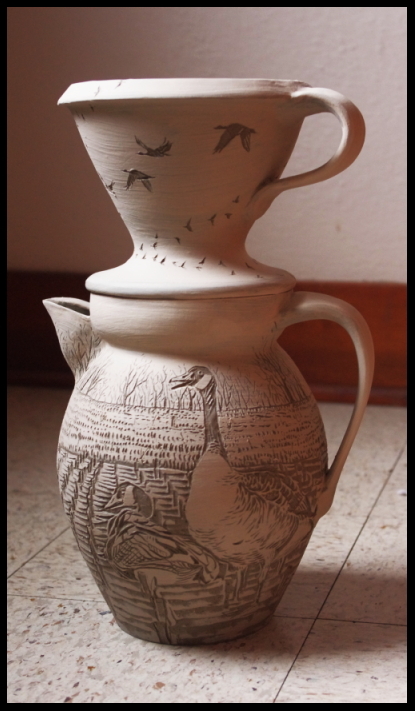 ere’s an image of a coffee-maker I finished carving yesterday in it’s green-ware state (unfired, unglazed). It is for a show I get to do with St Joe printmaker, Mary Bruno, at the Whitby Gallery of the St. Ben’s Monastery from mid June through July this summer. Mary and I have titled the show, Replanting Roots, and I will showcase my recent carved pieced beside Mary’s drool-worthy linoleum prints. The perfect pairing huh? Anne: when is your show in June? Mid June to late July, details this week….